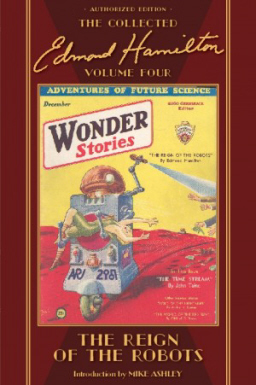 In a moment of weakness earlier this month, I decided to give away a copy of the long-awaited fourth volume of The Collected Edmond Hamilton from Haffner Press. Too late to back out now. How do you win one, you lucky dog? Just send an e-mail to john@blackgate.com with the title “Edmond Hamilton” and a one-sentence review of your favorite Hamilton novel or short story. And don’t forget to mention what story you’re reviewing. That’s it. One winner will be drawn at random from all qualifying entries and we’ll publish the best reviews here on the Black Gate blog. But time is running out — the contest closes April 18. If you need more inspiration. we recently covered several Edmond Hamilton books — including Starwolf and The Best of Edmond Hamilton — and we reprinted his very first story, “The Monster-God of Mamurth” (from the August 1926 issue of Weird Tales) in Black Gate 2. Haffner’s archival-quality hardcovers — including The Complete John Thunstone by Manly Wade Wellman; Henry Huttner’s Detour to Otherness, Terror in the House: The Early Kuttner, Volume One, and Thunder in the Void; Leigh Brackett’s Shannach – The Last: Farewell to Mars; and Robert Silverberg’s Tales From Super-Science Fiction — are some of the most collectible books in the genre and you won’t want to miss this one.